I never thought I’d say this about an issue of Batman, but this might be the gosh darn cutest story I’ve read in a comic book this year. The last issue of Batman, the first part of a duology dubbed “Superfriends,” dove into the emotional undertone of the lasting friendship beween Bruce Wayne and Clark Kent. This week’s Batman #37—by Tom King, Clay Mann, Seth Mann, Jordie Bellaire, and Clayton Cowles—forgoes some of that more serious sentimentality to have an almost cloyingly sweet time with Bruce, Clark, Selina, and Lois. It’s still touching, but it’s also just joyful and calm in a way you wouldn’t expect an issue of Batman to be. Continuing on from the last story, the supercouples finally get a moment to themselves in the form of a double date—a chance for Bruce and Clark to hash out their feelings about Bruce’s engagement, and for Lois to get to know the person behind the Catwoman persona. Clark being, well, Clark, picks a local fair as the scenery, only for the group to discover that there’s a superhero theme—no costume, no entry. Not wanting to recognizably show up as Batman and Superman, Bruce and Clark simply swap their costumes, with Lois borrowing the Catwoman suit, and Selina borrowing Lois’ dress (ostensibly to be a super-journalist, but Selina just uses her wiles to get past the entry). 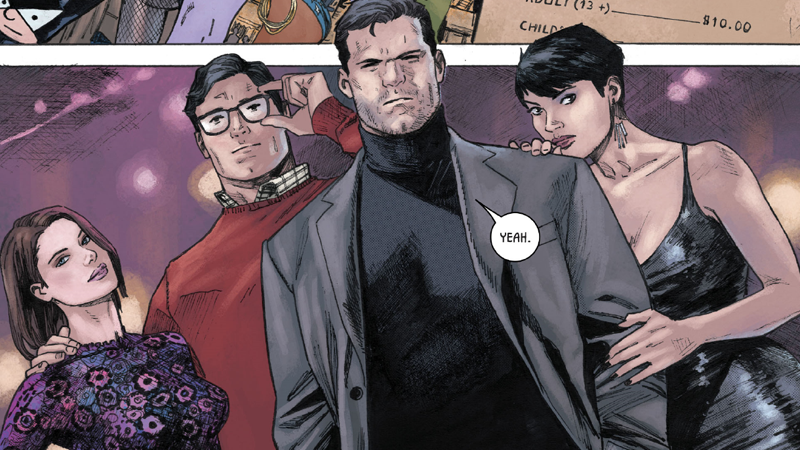 The fact that Clark still wears his glasses—the glasses he does not need—over the Bat-Cowl to maintain the disguise is one of the most earnest and innocently adorably “Superman” things to do. From there a double date happens. It’s twee, sure—eating corn dogs, a trip to the Tunnel of Love, Clark desperately trying not to use his super strength to get Lois a prize on a test-your-strength game, even trips to the batting cages and a ferris wheel ride—but the setting, as wonderful as it is, is just window dressing for these characters to mingle with each other. For Lois and Selina, that means exploring why each of them are drawn to Clark and Bruce in the first place. But there isn’t really a specific answer, and that’s kind of the point—the love between Selina and Bruce, the love between Lois and Clark, it transcends the differences between each partner. But they make similar points and silently come to a conclusion resembling that of their partners: Love doesn’t care that Bruce fell for the sort of criminal he’d usually be battling on the streets of Gotham, and it doesn’t care that the man with one of the greatest secrets in the world is smitten with one of its greatest investigative journalists. Love is indiscriminate to what is, ultimately, a trivial difference when it comes to bringing two people together. And that, really, is the point of it all. As the night winds down and the couples begin to make their way out of the fair, the conversation still lingers—and the underlying tone between the couples changes. Selina, just like Bruce, tries to turn it into a competition. But Bruce and Clark’s conversation becomes more intimate, as Bruce admits he has no idea how being in love with someone is meant to work, while his best friend assures him that he’ll find a way to figure it out along the way. These stories—the love between an uptown reporter and a farmboy with a secret, and the one between a high-stakes thief and a Dark Knight—should be, as the quartet ponders during the night, impossible. But the lives of Superman and Batman are filled with the impossible on a daily basis, so the conclusion is: Why shouldn’t they just accept the impossibility of their loves, too? When the double date comes to a close, and Bruce and Clark just can’t stop themselves from settling their batting cage bet, Clark puts it best: here’s to the impossible, be it love or be it Batman’s ability to hit a pitch from the Man of Tomorrow. As if to affirm that, of course Bruce makes the shot. And if he can accept that impossibility, then maybe he can accept falling in love as well.